Disclaimer: Please note that this article contains potentially controversial views that don’t necessarily represent those of Expert Pensions or its associates, and has been written to entertain, inform, and to promote good-spirited debate around the subject. 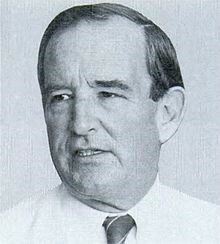 Republican US Congressman Steward McKinney, a graduate of Yale University and former sergeant of the US Air Force. And he was talking about Continental Illinois, in 1984. Continental Illinois… My guess is you’ve never heard of it. It’s interesting how most of you will have heard the phrase “too big to fail” but not the bank it was spoken about. Continental Illinois had history right the way back to the American Civil War, and once upon a time, it was one of the largest commercial banks in the US. I mean, top 10 big, with $40bn in assets, and this was back in the 80s. In May 1984, it suffered a $10bn bank run and became the (then) largest failure in US history. It was a very nasty business involving non-existent due diligence on bad loans for oil and gas companies purchased from another bank. Some guy called John Lytle even went to jail for three-and-a-half years after pleading guilty to a $2.25m fraud against the bank, and receiving over half a million dollars in kickbacks for approving risky loans. Like I said, nasty business. Given the massive potential consequences of Continental Illinois – then one of the biggest banks in the US – failing, regulators the Fed and FDIC stepped in with a multi-billion dollar bailout of new capital, new management, and emergency loans to prevent any financial losses to depositors and bondholders . Continental Illinois’s customers were big institutional investors, and the Reagan administration feared that if it collapsed, this might lead to bondholders withdrawing money from all American banks, leading to more bank runs and further collapses. This was the first bailout of a big bank since the Great Depression. Since the bailout, the bank changed its name to Continental Bank (1988), and by 1989 it was 100% owned by the US government, which subsequently started selling down its holding. In 1994, it was purchased by Bank of America. In 1989, a subsidiary of Continental Illinois, formed a private equity firm called CIVC Partners, backed by Bank of America. It’s still going today, with total assets of $1.3bn. Another pre-2008 US bailout was Long-Term Capital Management L.P., a highly-geared absolute return fund which failed in 1998, after suffering losses of £4.6bn due a big part to the 1997 Asian and 1998 Russian financial crises. 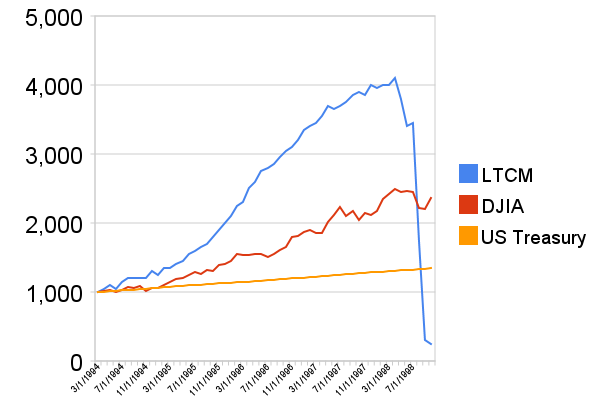 The below chart demonstrates the value of $1,000 invested in LTCM, the Dow Jones Industrial Average, and invested monthly in U.S. Treasuries at constant maturity. The fund was founded in 1994 and initially enjoyed strong returns. There were some really smart people on the board including founder John W. Meriwether, former vice-chairman and head of bond trading at Salomon Brothers – a pioneer of fixed-income arbitrage; and the 1997 winners of the Nobel Prize in Economics, Myron S. Scholes and Robert C. Merton. They won for developing the Black-Scholes mathematical model for pricing European-style options. By September ’98, the fund had failed to raise the capital it needed to survive, and while a joint buyout offer from some of the largest firms on Wall Street had been extended, the deal wasn’t struck. Given the potential widespread impact on the financial system, the Fed oversaw a bailout of $3.625bn by the fund’s major creditors. Once things had calmed down a little, The fund was liquidated and ultimately dissolved in 2000 at a small profit to the creditors who bailed it out. Unlike with Continental Illinois, no public money was used. When Lehman Brothers filed for bankruptcy on 15th September 2008, the expectation was that it would be bailed out by the US Government, as had happened with Bear Sterns back in March of that year. Lehman was the fourth-biggest investment bank in the US at the time, with a 158-year history an 26,200 employees. Of course it would be bailed out… Right? As we now know, Uncle Sam wasn’t there to bail them out. 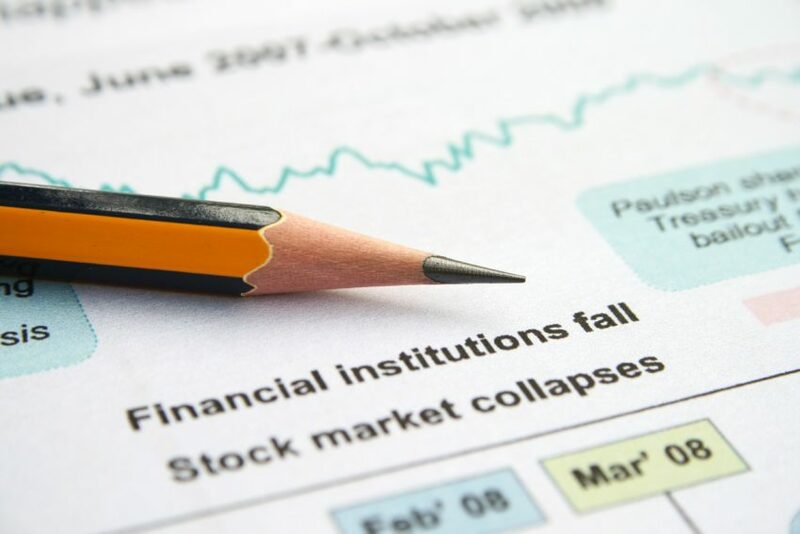 This led to distrust in the financial markets as banks stopped doing business with any other financial institutions which they thought were at risk of failing, because no one know who might get bailed out and who wouldn’t – and no one knew who might fail and who wouldn’t! Money stopped moving around the financial system. The stock market fell, and short-term credit markets seized up. In short, it was the US government’s refusal to bail out Lehman Brothers that triggered the 2008 financial crisis. In response to this, a bailout called the Troubled Asset Relief Programme (TARP) was signed into law by President George W. Bush. This plan directed $700bn of public money to purchase “troubled assets” (such as mortgage-backed securities and CDOs) from the big banks. There’s an argument that decades of deregulation led to the 2008 financial crisis, and even that the 2008 financial crisis was itself evidence that free capital markets don’t work. But there is an opposing theory that in the decades leading up to it, banks actually became closer to, and more dependent on regulators and the US government due to the potential for bailouts if needed. Uncle Sam would always be there with his debit card and his authority – either using public money, or (in the case of Long-Term Capital Management) to intervene on behalf of the failed institution, even after a private deal with Wall Street bigshots had failed to be made. By bailing out financial institutions, the message from multiple US governments (Continental Illinois under Reagan, Long-Term Capital Management under Clinton, and TARP under Bush) is that if investors purchase bonds from or make deposits in a big bank, this is as safe as lending it to the US government, because if the bank fails, we’ll bail it out. Effectively, you can get the yield of a corporate bond and/or savings account, but with the security and safety of a US treasury. This encouraged investors to put more money into the big banks, and for the big banks to take greater and greater risks in pursuit of profit. For example, by undertaking higher levels of gearing, and investing into risky assets such as sub-prime mortgages, safe in the knowledge that they’d be bailed out by the US government if it all came crashing down. While the bailouts of Continental Illinois, Long-Term Capital Management undoubtedly averted a short-term crisis, and while TARP undoubtedly helped a lot of people in the short and medium term, the question is: what is the best solution for long-term free-market efficiency? The UK has a great solution for this which seems to be working well: principles-based regulation, as opposed to hard-and-fast rules. The FCA’s strategic objective is to make financial markets work well. It’s operational objectives are to protect consumers, enhance the integrity of the financial system, and promote a competitive market. This is brilliant. These should be the objectives of any financial regulator. And the PRA has been set up to ensure that if a financial institution does fail, it fails in a way that doesn’t disrupt the industry. In short, the UK has it figured out. We’ve learned from 2008. Strong, principles-based conduct, micro-prudential, and macro-prudential regulation coming together, with clear objectives. But there is one more thing we could do: stop bailing out firms that fail. If we take this approach; if we remove the safety net, not only will banks need to stop taking unnecessary risks as they did in the lead-up to 2008 – lending bad mortgages to people who can’t pay it back and investing in toxic CDOs, but institutional investors such as life offices and occupational pension schemes may be much more prudent about where they invest, conducting serious due diligence and capital adequacy checks on their banks, thereby helping to ensure banks behave themselves. It might just be that if, the next time a big bank goes under, we don’t bail it out, there might be some short-term pain and panic. But there may be significant long-term potential benefits when we turn around and says “no, not this time”. Directory, 99th US Congress, p. 24. Power, 1990: Simon & Schuster. Additional research for the article was from the Manhattan Institute, Wikipedia, the Federal Reserve, and the New York Times.